In my last post, we looked at “Ten tips for effective email use“. Here we’ll take a look at how you can (hopefully) achieve the zen-like state of “Inbox Zero”. Inbox Zero is a rigorous approach to email management aimed at keeping the inbox empty - or almost empty - at all times. That’s a rather symplistic approach to what I think can be a complicated and actually emotional (yes!) subject. Inbox Zero is not a new concept. I first read about it on Merlin Mann’s 43 Folders Website, in 2007 (yes young people, the Internet goes back that far!) a site that is unfortunately no longer maintained but well worth an in-depth read all the same. At the time Inbox Zero was a ridiculous concept to me. No Emails In My Inbox??? But I have 2000+ emails in there. They can all go??? MADNESS!!!! Now, I get annoyed if I have more than a few unread, un-filed or 5+ starred emails that I have to look at each day. How times have changed! Since 2006 (Yes, Okay I’m and old person!) I’ve tried to not have millions of emails in my inbox. One of the reasons Inbox Zero started (amongst the need to keep things tidy) is due to the restrictions placed on us poor office workers by I.T departments thanks to the c%$p-fest that is Outlook/Exchange server and just went from there. 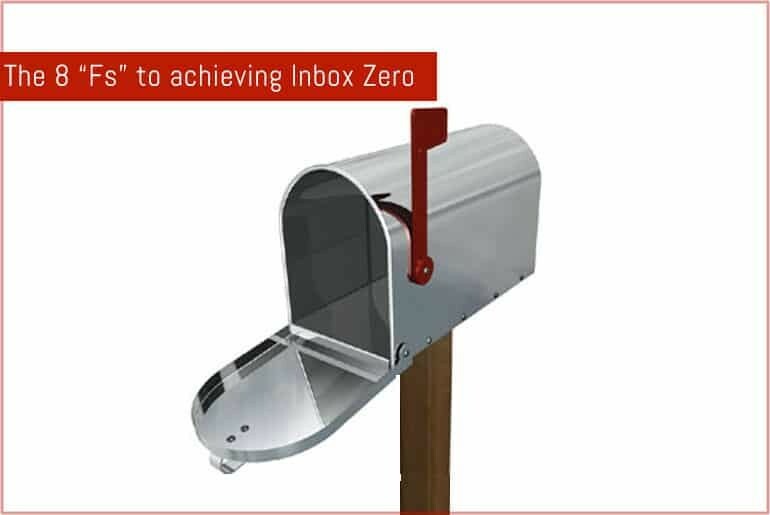 In this post, I will give you eight simple tips to achieving Inbox Zero that you can actually use and find practical. These tips have worked for me over the years so I hope I can impart a bit of actual knowledge (for a change) and help you all on the road to email freedom. So, without further ado…. Here are the “F’s” to Free you from your email burden. When you first start looking at getting to Inbox Zero, it won’t be a five minute fix. Block out a few hours (at least) of your time to put the following tips into practice, and then make sure you block out some further time each day/week/month that you wish to tackle your inbox. As much as you (or I) try, it won’t magically get itself to zero by itself so you need to allow yourself time to process it. This sounds counter-inutitive but you need to give yourself some time to sort out the mess you are currently in before you can even try to deal with new information. Turn off your wi-fi and take the plunge. Make sure that you can manage your email offline though – you need to able able to file, delete, create folders, filters etc. without having the distraction of new emails coming in. Make sure that whatever changes you make will sync back up once you reconnect. Depending on your email system, these may be called folders or labels but make sure you are ruthless in what you set up. You can never have too many, they can alway be deleted later. For example, I have a folders for newsletters, blog related items, receipts, website alerts, charity items, and more.That way they’re out of my Inbox automatically and I can look at them when needed.Any topic that you’re going to have more than 2-3 emails for a week, set a folder up. And in order to get emails into it you need to…. Each time an email hits my inbox Gmail filters the new emails against the criteria I’ve set and puts them into their relevant folders accordingly. This is great as I know that I can check out my Google Alerts folder when I feel like it, or breeze through my Newsletter folder when I want. This keeps my inbox free of items that I don’t have to read right now, just when I have time and leaves the important (or yet to be filtered) items for me to deal with. Throw away what is unnecessary. By this I mean anything that’s out of date. If it’s: stuff you haven’t replied to for 7 days (or more/less depending on your needs), a coupon offer that’s no longer valid, something that you’ve already replied to/dealt with then bin it. Or at the very least set up a “To Delete” folder that you can bung file everything in that you’re not sure about in order to process later. Try not to be sentimental. If you want to keep an email, make a folder and file it, don’t just leave it lying in your inbox. It either serves a purpose or no purpose – and if it has a purpose then it has a (filing) place. Don’t think that you have to achieve “Inbox Zero” every day. Don’t think that you have to achieve it every three days either. Pick a schedule that you’re happy with and stick with it, it can be once a day, once a week or even once a month, whatever suits you. It may seem to be overwhelming at first, or not worth the trouble but I can assure you that once you have started to whittle down the contents of your inbox you’ll want to stick with it. And if you aren’t able to go through your inbox (or just don’t get around to it for a while) don’t think that you can’t catch up. That’s what your filters are for. Only the important stuff will be in your inbox, everything else will be nicely stored away for later reading.